Many of you may have heard about rewinding a motor. 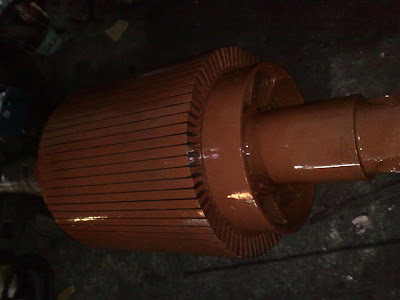 It is necessary to rewind a motor when its winding get defective. It happen in many ways. 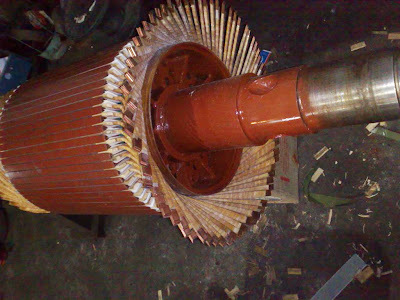 But the common fault is burning of winding due to insulation failure or overload. Here I am trying to explain the rewinding process of a slip-ring induction motor. 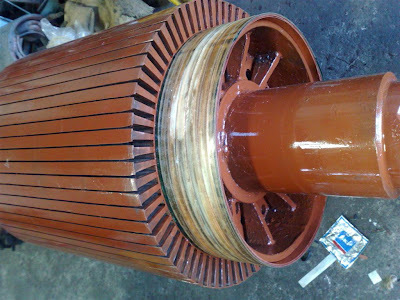 This is a 435kW induction motor rotor. This is the rotor that we are going to rewind. All the coils are removed from the slots and it is cleaned. After that two coats of red varnish is applied. 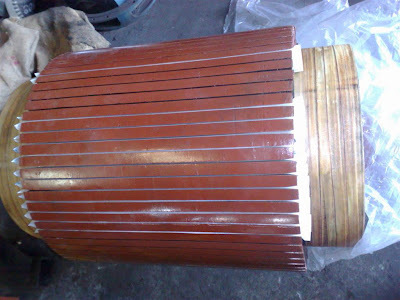 This is to improve the insulation resistance value and to protect core from corrosion. After all the above process the rotor looks as above. Now it has a pleasing look. Now the next part start. The above picture shows the winding overhang support. It is insulated using Fibre Glass tape. This has to be before starting rewinding. Now we are going to make the coils. 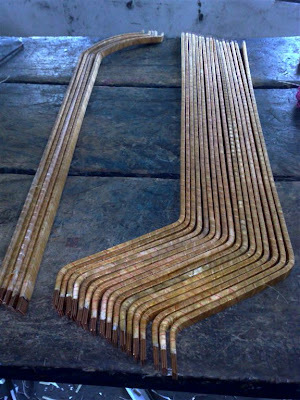 Here we are using annealed copper strips of electrical grade for making rotor coils. These strips in various size comes in spools and then they are cut in to required length. 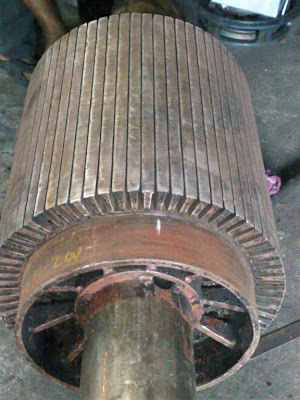 After that they are insulated as per the voltage and other characteristics of machine. 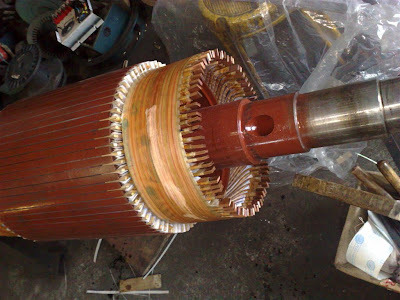 Here we are having a LT (415V AC Motor) winding. So we are insulating it with mica glass tape, NOMEX tape and then with fibre glass tape. After that one end of the conductor is bend in to the required shape. Rotor slots are also to be insulated. Here we are using NOMEX paper for slot insulation. Paper is cut in to required size and then placed in the slot as shown in the above picture. After insulating all the slots coils are inserted. Only one end of the coil is bend. The other end is shaped after inserting in the slot. Here all the conductors are inserted and we can shape the coil. The other end is also shaped. 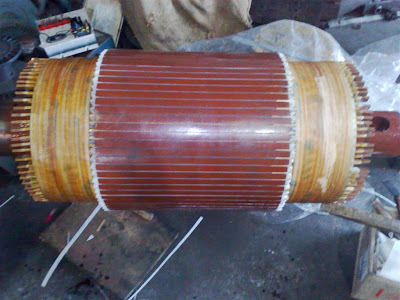 Another view of coil after shaping. After shaping is complete both ends are banded using fibre glass tape. It has two purpose one is to act as an insulator and the second is to prevent the expansion that can happen while rotating. 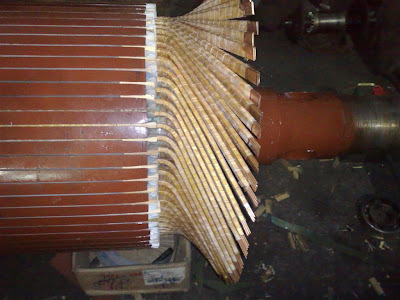 After completing the winding additional steel banding will be done to protect the winding from the centrifugal force during running. This rotor have two set of winding. Here one set is over (bottom set) Now one more has to be done. That will come on the top of this winding. I will be back with that pictures next time. So thats all for now. Hope it was informative. Interesting post. 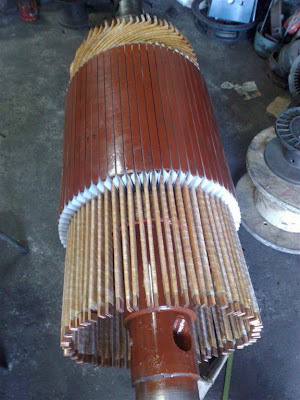 I am looking for blogs related Stator Winding Machine.